So after two and a half years of not blogging I’ve decided to start again, ironically I decided this on the 4 year anniversary of starting my blog. I had no clue it was today, until I logged on and it told me! I’ll continue to write about what the Lord is teaching me and topics that are important to me. The Lord has been teaching me s much these last two years, my life has been turned upside down over and over again. I’ve lost friends and people I thought would be in my life forever, but I’ve gained so many too. My plans have made a complete 180 (several times) but through it all the Lord has remained so faithful. Recently I have been reading a devotion on forgiveness, a couple of weeks ago I read this passage in Matthew about forgiving somebody. 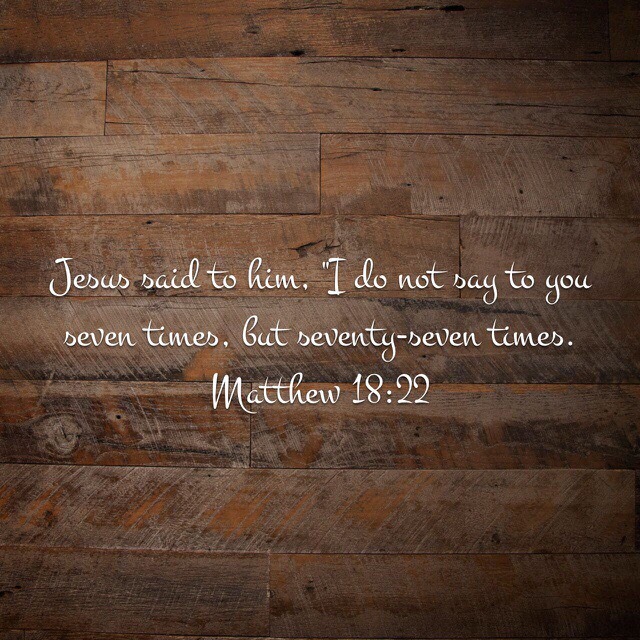 When asked how many times we should forgive someone, Jesus replied 70 x 7, which equals 490, I don’t believe He was saying stop forgiving someone when they have wronged you 491 times, but instead saying you should forgive people infinity after reading this I was finally able to let go of the anger and hurt in my heart that has been there for years. As I was journaling about this passage I began to wonder if I had the opportunity to take back all the things people of done to me over the years, would I? After giving it a lot of thought I came to the conclusion that I wouldn’t take it back. Even though those things have hurt me, they have made me the person I am today and I am starting to love that girl, and use that hurt to help other people. I am excited about this new season in my life. Somebody once told me that not forgiving someone is like swallowing poison and expecting the other person to die, that stuck with me and let me tell you, holding hate in your heart is draining, but forgiveness feels really great!! Forgives doesn’t have to just be about someone else, you have to forgive yourself too, that part I’m still working on, but I’m excited for it. Life is short don’t waste it by not forgiving somebody. Who do you need to forgive? How are you going to do it? What’s stopping you?